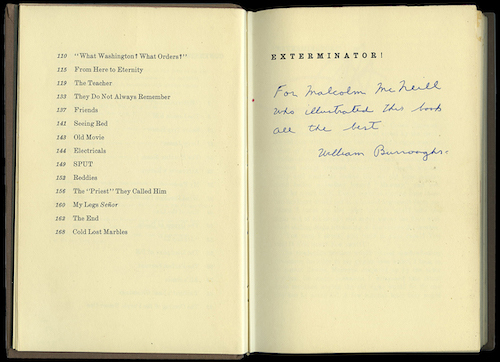 Note: Malcolm Mc Neill is offering an inscribed copy of EXTERMINATOR! as well as four unpublished drawings he made for the book at William Burroughs’ request. RealityStudio has interviewed Mc Neill about his intensive collaboration with Burroughs. His artwork for Ah Pook Is Here has been collected in The Lost Art of Ah Pook. He has also written a compelling memoir about his collaboration with Burroughs, Observed While Falling: Bill Burroughs, Ah Pook, and Me. Interested parties should contact Mc Neill directly. For financial reasons, the illustrated publication did not materialize. The images were a first attempt at trying to visually represent Bill’s cut-up. Ah Pook is Here was concerned with the “images of fear,” and “butterflies in the stomach,” as a metaphor for anxiety, functioned as a visual interpretation of the idea. All four images were subsequently used as an illustration for an interview with Allen Ginsberg in The Berkley Barb in 1974 and the background of the second was reprised as an illustration for Bill’s column in Crawdaddy Magazine in 1975. The book is signed and inscribed to me specifically as its illustrator by Bill. I loaned it to his notorious friend and collaborator Jacques Stern in New York, who in his inimitable manner made “notes to self” on some of the pages. The book is a record of three individuals who collaborated together in the 1970s. A copy of Jacques’ collaboration with Bill on the film treatment Creation of Adam was also marked in this way. The images are each 16.5″x10.5″ created in graphite and ink and mounted on illustration board. The fourth in the series suffers from rubber cement stains on the back. The images were illustrations made specifically for reproduction; in those days illustrators rarely received the original artwork back and methods of mounting and gluing were not done with any sort of longevity in mind. Higher resolution images can be sent via Hightail. Written by Malcolm Mc Neill and published by RealityStudio on 3 October 2018.